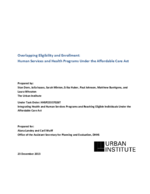 This appendix describes the microsimulation methodology used to estimate health and human services eligibility and receipt. The tabulations for this report are drawn from information from two large microsimulation models, the Transfer Income Model, Version 3 (TRIM3), which is developed and maintained by the Urban Institute under primary funding from ASPE, and the Health Insurance Policy Simulation Model (HIPSM), also developed and maintained by the Urban Institute with funding from multiple sources, including ASPE, the Robert Wood Johnson Foundation, and the Kaiser Commission on Medicaid and the Uninsured. HIPSM was used to estimate whether or not individuals were offered affordable employer-sponsored insurance, and then this information was imported into TRIM and combined with TRIM estimates of Modified Adjusted Gross Income (MAGI) to determine whether individuals qualify for HIM subsidies. Medicaid eligibility was estimated in TRIM using program rules simulated for 2014 (e.g., MAGI less than 138 percent of poverty or otherwise eligible). In addition, TRIM was used to estimate human services program eligibility and receipt. The following information provides a more detailed description of the methodologies used by each model. Our results are based on HIPSM’s simulation of the ACA as if it were fully implemented, including an expansion of Medicaid eligibility to 138 percent FPL. HIPSM augments the underlying Current Population Survey (CPS) data with imputations of health care costs, premiums, Employer Sponsored Insurance (ESI) offers, immigration status, and detailed Medicaid eligibility type.38 For purposes of this analysis, HIPSM’s imputation of ESI offers was exported to TRIM for purposes of determining eligibility for HIM subsidies.